Microsoft has officially revealed the name of the successor to Windows Vista, and it’s not Vista II, ReVista or AltaVista. Its Windows 7. No definite release date for Windows 7 has been announced by Microsoft. So what’s in Windows 7? The most visible new features are enhancements that streamline core Windows tasks like connecting to a wireless network or organizing a digital music collection. But the new OS features are more than just skin-deep; there are also improvements to core components, such as an innovative way to stream music and other media directly to network-connected media players. 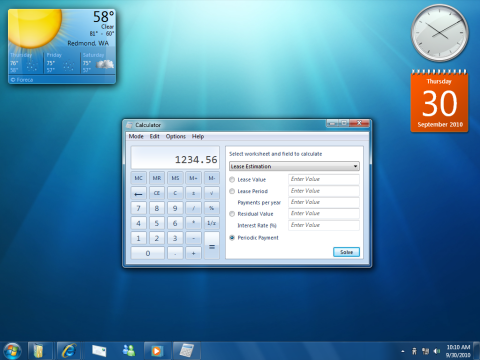 For starters, the Quick Launch bar is gone; its capabilities are now integrated directly into the taskbar. If you recognize some similarities to the Dock in OS X, you’re half right. You can permanently place program icons on the taskbar, where they allow one-click access to programs. Running programs appear on the taskbar as well. You’ll find that other common tasks have been greatly simplified. For example, it;s now much easier to connect to a wireless network: when a wireless network is available, a tray icon glows. Click to pop up a list of available networks, and click again to choose a network and enter a passphrase or connect to a browser-based logon screen a a hotspot or airport. Networking is tricky, especially for home users. With Vista, Microsoft tried to consolidate networking features in a single location, the Network and Sharing Center, with decidedly mixed results. In Windows 7, the Network and Sharing Center gets a radical overhaul designed to make it simpler to set up and manage small networks. In Windows 7, the Network and Sharing Center includes four links to common tasks instead of a long list of detailed options. Homegroups also offer an interesting capability that digital media fanatics should love: From within Windows, you can stream media to any DLNA server or to a Media Center extender, without jumping through a bunch of configuration hoops. Enterprise customers will have plenty of new stuff to chew on, as well. The PowerShell scripting language is part of Windows 7, as are a host of new troubleshooting and administration tools. Special mention for the new Program Compatibility Troubleshooter, which lets you fix programs that fail to run correctly because of permission problems or hard-coded version checks. BitLocker also gets a new features: the capability to encrypt the contents of a USB flash drive or other removable storage device. This is a logical extension of the BitLocker feature, which first appeared in Vista and was enhanced in Vista Service Pack 1 to allow encryption of hard disks other than the system volume.